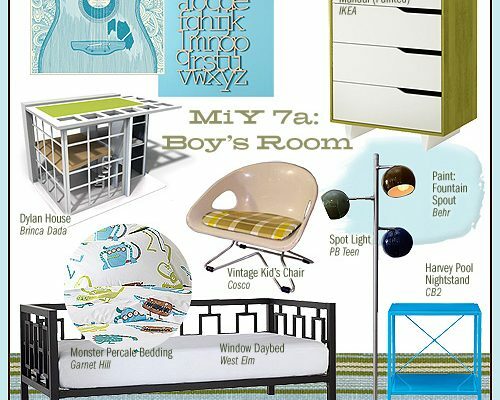 Making it Yours (MiY) is all about finding ways to update your home using the items you already have. In this edition of MiY, I’m using four key pieces to create five different looks. The bed, studio sofa, lighting, and tables are the same as in the first two designs (4a: Striking Stripes and Polka Dots and 4b: Feminine Moorish), and there will be two more looks after this one. I really like the idea of the apple and the pear pillows representing the couple that sleeps in that bed together! Those sheets (on sale for half off) look like sketched stripes until you look closer and see that the print is made up of tiny triangles. And because I love red and aqua together, we have the reversible quilt with two lovely shades of blue, pale aqua paint on the wall, and sheer linen curtains in a similar tone. Soft rugs like this shag are perfect in a bedroom, and that giclee print is a fun, colorful addition. The upcoming fourth design will feature various shades of greens and blues, and we’ll be seeing that quilt again. Especially like how the Etsy print reflects shapes in the rest of the room–the accent tables and the pear and apple shapes speak to me. Yes, red and aqua are good friends and the green sofa doesn’t dominate in this triad of colors. Ooh, I’m excited to see the next design with greens and blues! Those are the colors that I use in every room of our little house. My favorite part of this look are those super cute Jonathan Adler pillows. I just ordered salt and pepper shakers from his line for Barnes & Noble. Love this! Those sheets are just awesome! So fresh, open, and airy! Love the pillows. Just the thing for this cold snowy winter day! This is my favorite one. I love the colors and designs and feels very fun-modern. 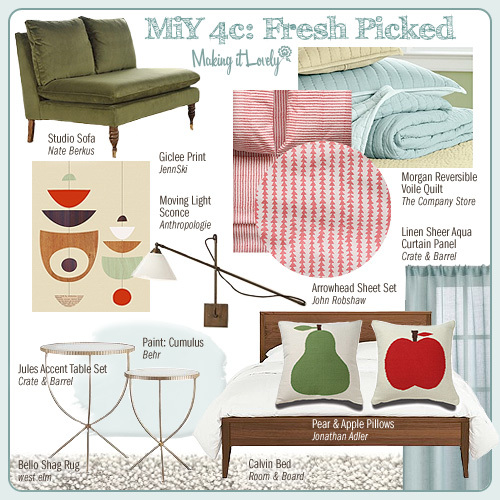 Love love the fruity pillows! The apple and pear cushions are adorable. Beautiful look! At first glance, I didn’t like this MIY at all, preferring your first two much more. But then I read your descriptions of everything and now I think I’m in love – with red and aqua together! I’ve never thought of that color combination before, and now it makes me wish I had some blue and/or red in my house SOMEWHERE. Alas, those are two colors that aren’t even making an appearance as an accent. But maybe someday. I love that Nate Berkus sofa!!! I just saw those panels at Crate and Barrel yesterday and they are so cute. I love your blog and your monthly Eleanor photos. love! my favorite look yet. Those Jonathan Adler pillows are too cute! These sheets kill me (would look so cute i think with my yellow striped duvet!!!) also, an un related question..but what is the font you use in the “MiY 4c: Fresh Picked” header? I love how you get the look of pencil strokes inside the type!! Oh, I just ordered those sheets from Anthropologie this morning. I couldn’t believe they were half off!! I love aqua and red together. LOVE the apple and pear cushions! This is my favorite yet. I love the fruity pillows. Just right for a fruity couple like me and my husband. And I mean “fruity” in the best way possible. I am so amazed/inspired by everything you do! I have a 7 month old baby and can’t seem to get anything done and you create create create while caring for your wee one. You mustn’t sleep. Some day I hope to have some successful designy thing going on but until then, I love seeing what you do! Cheers! I’m a big fan and rarely comment, but I love the aqua/red combination! And I agree with Chris above; it’s inspiring to see you dive into creativity even with a little one in tow. I love the Robshaw sheets with the quilt. Our wedding colors were aqua and red. Would be great to go to bed every night remembering. You have a wonderful blog. 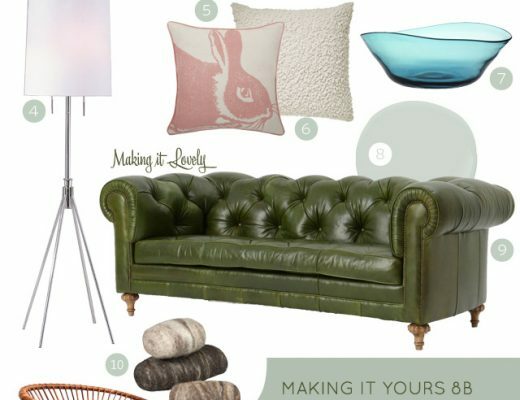 Alright, this edition of Making it Yours gets my pick (with the Seaside Fair in a close second)! I love those Arrowhead sheets from Anthropologie. Darn you Anthropologie. Darn you!